Obverse inscription: RICVS RE[ ] The 'R' of RICVS starts at the 1 o'clock position which suggests a Class V-VII. Reverse description: A voided long cross with three pellets in each quarter. 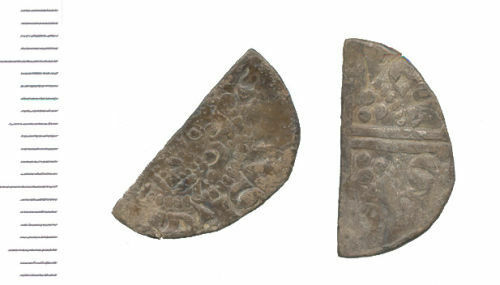 Medieval coin: cut halfpenny of Henry III minted in Canterbury between 1251 and 1272. A silver cut halfpenny of Henry III, voided long cross, uncertain mint, moneyer Renaud, 1251 - 1272.